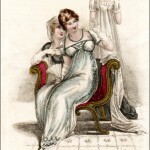 Lady’s Monthly Museum, July 1799. This is only the second year of publication for this relatively inexpensive magazine. During the first couple of years, each monthly issue included 2-3 hand-colored prints, each showing 2-3 figures. I really love these early prints, even if they are not nearly as well-drawn or as carefully-painted as those from its future competitors, La Belle Assemblée and Ackermann’s Repository of Arts. 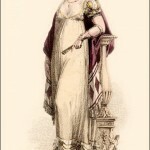 In 1799 its only real competitor was The Lady’s Magazine, which had stopped including fashion prints but was inspired by the Lady’s Monthly Museum to resume them in 1800. The very exclusive and expensive Gallery of Fashion had been producing exquisite fashion prints since 1794, but the Lady’s Monthly Museum was meant to be accessible to a more general (ie not so upscale) audience. 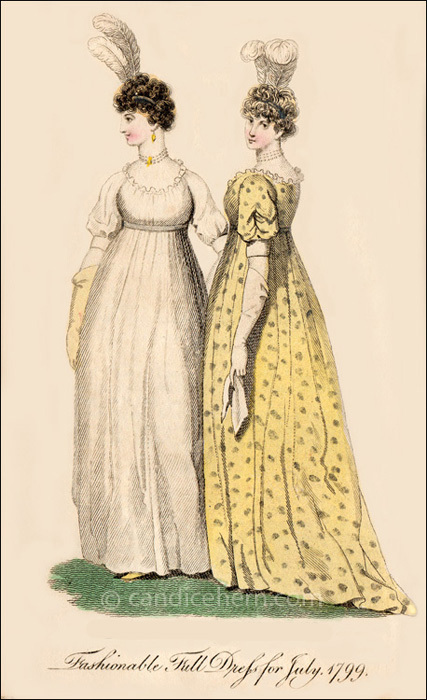 It was very common in these early Lady’s Monthly Museum prints to show two versions of the same dress in a single print, or the same dress shown from both the front and the back. This made it easier for the reader, or her dressmaker, to copy the style. It is difficult to see online, but the silver waistband on the white dress and the silver spots on the yellow dress are painted in silver metallic paint. 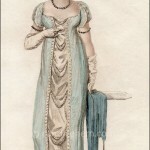 The expensive Gallery of Fashion was famous for its delicate use of metallic paints, and this print shows the inexpensive Lady’s Monthly Museum attempting a similar look.